Nick O’Malley writes in the Sydney Morning Herald (14 November 2018), about the support of former judge, David Harper, for the creation of a national commission against corruption. In O’Malley’s considered view, Australia is becoming more corrupt. In the wake of the rising number of publicly known incidences of corruption, the call for such a commission has widespread support across Australia. Australia is becoming more corrupt because successive federal governments have failed to create an effective national anti-corruption body similar to the NSW Independent Commission against Corruption, a leading jurist has argued. Writing in support of a national anti-corruption body, David Harper, a former Court of Appeals justice at the Supreme Court of Victoria, noted that in 2012 Australia ranked seventh in Transparency International’s global corruption index, but that today we were ranked 13th. “The lack of a federal anti-corruption agency remains a reason why we have never come close to being corruption-free,” he has written in an opinion piece for the Herald. Mr Harper writes that the lack of an effective federal anti-corruption watchdog had allowed corruption to flourish undetected and, in turn, allowed federal politicians to hide behind the myth that the federal sphere is free of corruption. “In NSW, Victoria, Western Australia and Queensland, extraordinarily serious instances of corruption have been unearthed by royal commissions or broad-based anti-corruption authorities,” he writes. “A survey by the Victorian Independent Broad-based Anti-corruption Commission (IBAC) found that 40 per cent of past, present and prospective suppliers to government agencies believed corruption in public sector procurement to be either a major or moderate problem. Mr Harper’s piece was written in support of a briefing paper prepared by the Australia Institute, which is lobbying for a similar federal body, for federal crossbenchers, who last month announced their support for a federal anti-corruption body. Labor also supports the proposal. So far the government has opposed such a body, or discussed one with far more limited powers. The paper finds that the NSW Independent Commission Against Corruption remains the most effective of all the state-based anti-corruption bodies. According to the paper, between 2012-17 the ICAC started 290 investigations, held 30 public inquiries and made 96 referrals for prosecution. The next most effective state anti-corruption body, Queensland’s Crime and Corruption Commission, launched 293 investigations, held two public inquiries and made 33 referrals for prosecution. “The design of a National Integrity Commission is critical to ensure its success in investigating and exposing corruption,” says the Australia Institute report, prepared by a panel of former judges and corruption fighters from across the nation. “Design features such as broad jurisdiction to investigate any conduct that may affect the impartial exercise of public office, and strong investigative powers contribute to NSW ICAC being the most effective state anti-corruption agency. 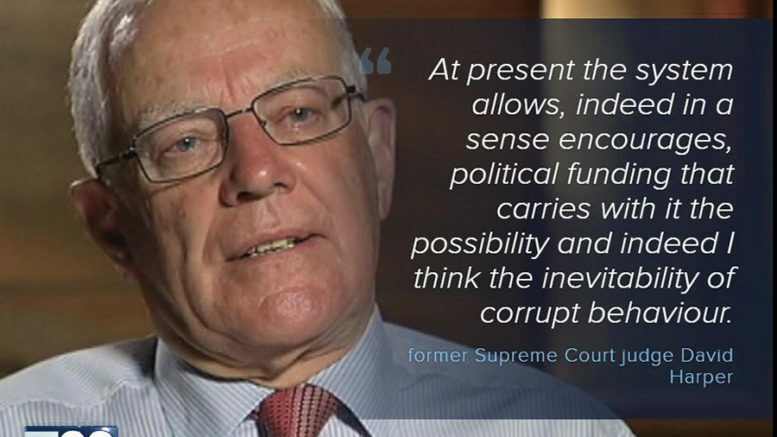 1 Comment on "Australia becoming more corrupt warns former judge"
Blind Freddie can see that – a statement of the bleeding obvious. Only our votes will give the mandate for the federal government to proceed with dispatch to implement the establishment of such a body, modeled on NSW’s ICAC and nothing less.